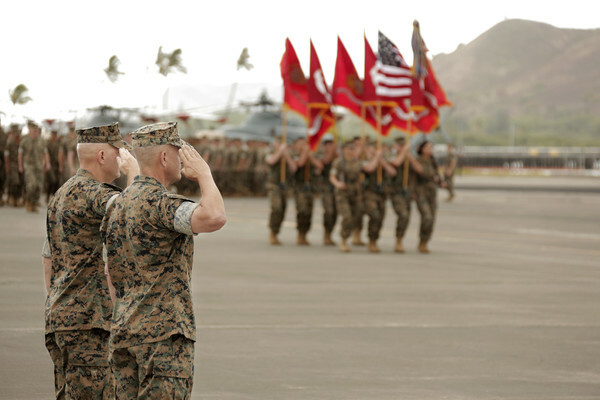 U.S. Marine Corps Lt. Gen. David H. Berger relinquished his duties as commander of U.S. Marine Corps Forces, Pacific, or MARFORPAC, to Lt. Gen. Lewis A. Craparotta at a change of command ceremony on Marine Corps Base Hawaii Aug. 8, 2018. While at MARFORPAC, Berger served as the commander of all U.S. Marine Corps forces assigned to the U.S. Indo-Pacific Command, and as the commanding general of Fleet Marine Forces, Pacific. Berger assumed command of MARFORPAC Aug. 26, 2016. During his time as commander of MARFORPAC, Berger oversaw numerous developments in the Indo-Pacific theater of operations. Berger supervised the introduction of the F-35B Lightning into III Marine Expeditionary Force, the forward-deployed force-in-readiness in the Indo-Pacific region. His tenure also saw the initial deployment of the F-35B with the 31st and 13th Marine Expeditionary Units, the first operational deployments of the F-35B with a MEU. As commander, Berger has continued to build upon the strong interoperability of partner nations within the Indo-Pacific. The continued success of the Marine Rotational Force, Darwin, a six-month rotational deployment of U.S. Marines in Australia, reflects the enduring alliance and common security interests in the region and improves interoperability between the U.S. and Australia. He facilitated the growth of MRF-D from a rotational force of 250 infantry Marines to a full Marine Air-Ground Task Force capability, including an artillery battery and a complement of MV-22B Osprey tiltrotor aircraft. Berger also oversaw the larger integration of the MV-22B Osprey into the Indo-Pacific theater with capabilities which significantly enhance the Marine Corps’ ability to perform humanitarian assistance and disaster relief, respond to crises and fulfill other alliance roles in the region. Highlighting the larger role the MV-22Bs are now playing, four Hawaii-based Marine Corps Ospreys made history in 2017 when they self-deployed to Australia from Marine Corps Base Hawaii and back again, marking the first times the MV-22B Osprey had made trans-Pacific flights. During his tenure, MARFORPAC led the annual Pacific Amphibious Leaders Symposium, or PALS, in the Republic of Korea and Hawaii with representatives of allied and partner militaries from around the Indo-Pacific region. PALS, in conjunction with other exercises and events, results in better training and interoperability between friends and partners throughout the region and helps pave the way for enhanced stability and economic ties beneficial to all Indo-Pacific people. The Commandant of the U.S. Marine Corps, Gen. Robert B. Neller, was in attendance for the change of command ceremony and spoke about the importance of the MARFORPAC command. Berger relinquishes command of MARFORPAC to Lt. Gen. Lewis A. Craparotta. Craparotta comes to MARFORPAC from I MEF in Southern California, where he served as the commanding general. Berger’s next assignment will be as the Deputy Commandant of the Marine Corps for Combat Development and Integration, Headquarters Marine Corps, and commanding general, Marine Corps Combat Development Command, Quantico, Virginia.